You may need a tooth extraction for any number of reasons. Some teeth are extracted because they are severely decayed. Others may have advanced periodontal disease or are broken in a way that cannot be repaired. Other teeth may need removal because they are poorly positioned in the mouth (such as impacted teeth) or in preparation for orthodontic treatment. The removal of a single tooth can lead to problems related to your chewing ability, problems with your jaw joint, and shifting teeth, which can have a major impact on your dental health. To avoid these complications, Dr. Smith and Dr. Mandava will discuss alternatives to extractions as well replacement of the extracted tooth. At the time of the extraction we will numb your tooth, jawbone, and gums that surround the area with a local anesthetic. The dental assistant will first apply a topical anesthetic to your gums in preparation for the local anesthetic. Once the local anesthetic has been administered, it will take a few minutes for you to feel numbness in your mouth. During this “waiting period” we will go over the procedure with you and answer any questions you may have. Be assured that we will not start with the extraction unless you are completely comfortable. Some bleeding may occur. Continue to bite on gauze pads for 1 ½ hours after leaving our office. Some slight bleeding is expected to occur thereafter, which can be helped by continuing to bite down on gauze pads. If bleeding is persistent, place a dry tea bag (not herbal tea!) on the extraction site and bite to apply pressure for one hour. Avoid strenuous activity for 24 hours. A blood clot needs to form in the socket where the tooth has been extracted. This is an important part of the healing process and you must be careful not to dislodge the clot, which results in a painful dry socket. DO NOT rinse, swish or spit for 24 hours after the extraction. DO NOT drink hot liquids. After a tooth has been extracted there will be a resulting hole in your jawbone where the tooth was. In time, the extraction site will smooth and fill in. This process can take many weeks or months. However, after 1- 2 weeks you should no longer notice any inconvenience. Dry socket is when a blood clot fails to form in the socket where the tooth has been extracted. Or the clot has been dislodged and the healing is significantly delayed. 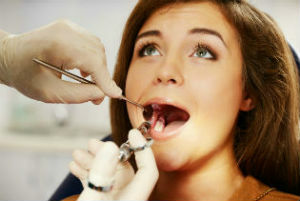 It tends to occur two to three days after the extractions. Call us if you think that you have a dry socket. Dr. Smith or Dr. Mandava will apply a medicated dressing to the dry socket to make you comfortable. If you experience pain, you might use your usual pain reliever, i.e. a non-prescription pain relief medication such as acetaminophen or ibuprofen unless Dr. Smith and Dr. Mandava direct you otherwise. For most extractions, be sure you do your chewing away from the extraction site. Stay away from hot liquids and alcoholic beverages for 24 hours. A normal, yet soft diet is advisable. After the extraction, do not brush the extraction area for 24 hours. After 24 hours gentle thorough brushing is advised. Roll your head around with a large mouthful of water and let paste and water FALL out of your mouth when brushing. Avoid commercial mouth rinses, as they tend to irritate the extraction site. Beginning 24 hours after the extraction, you can rinse with warm salt water (one rounded teaspoon of table salt in a cup of warm water) after meals and before bed. Continue this regiment for 3 days.